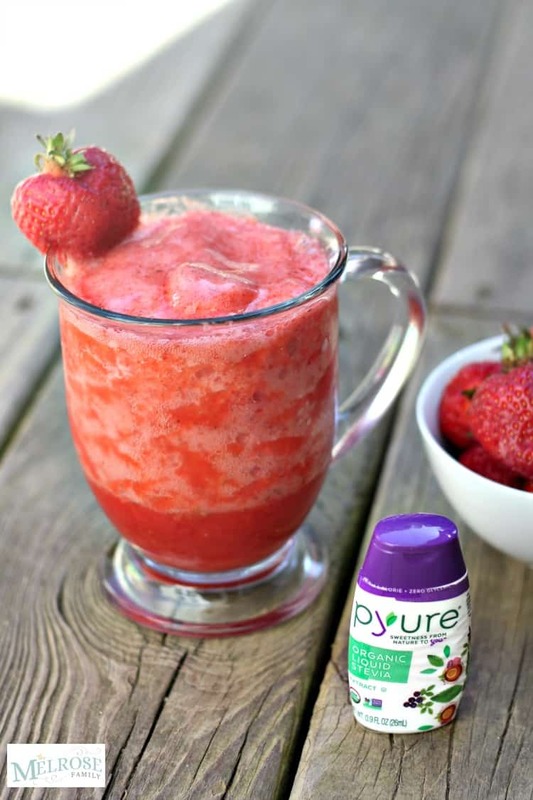 A refreshingly, easy three ingredient sugar free strawberry slushie that the whole family will love and want to drink all summer long thanks to Pyure for partnering with us to bring you this recipe. If you’re following along with us on Facebook you know that the Summer weather has hit North Carolina already. We’ve been on the lake for about two months now. My crazy girls have been swimming and tubing since March. I just recently got on the tube and realized how old I truly am when I woke up the next morning with bruises on my legs from the barrel roll I did across the lake after my loving husband took a turn with the sole purpose of knocking me off the tube. The warm weather doesn’t just mean lake days though. It also means strawberry picking! Strawberry picking is one my mom’s favorite things to do. Since she can’t be here and it’s not quite strawberry picking season up in New York yet, I try to come up with a fun recipe that I know she’d love. 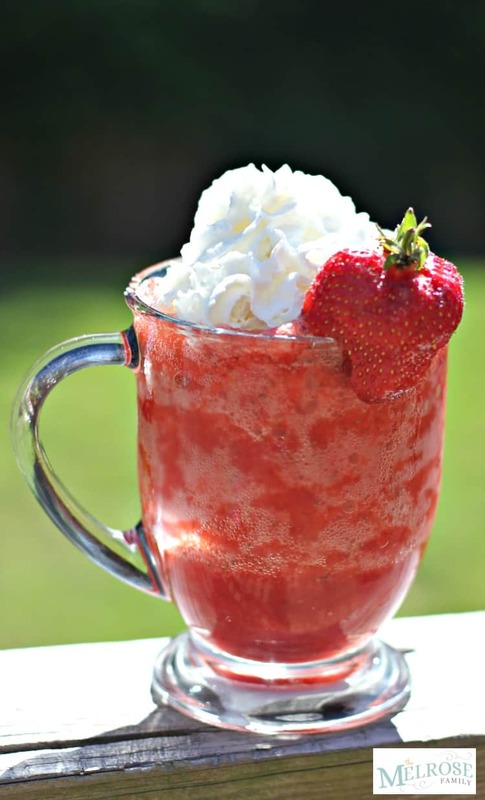 Not only would she love this sugar free strawberry slushie recipe, but my girls love it too! At the farm that we go strawberry picking at here in North Carolina they serve strawberry slushies in those huge slushie means that you see at a 7 11. They are delicious and the perfect refreshing beverage after picking strawberries in the warm sun. Their slushies are delicious, but my teeth ache from all the sugar in them. I decided to recreate the slushies, but I made sure to make them sugar free and as you can see from Avery’s face, she can’t tell that they’re sugar free. 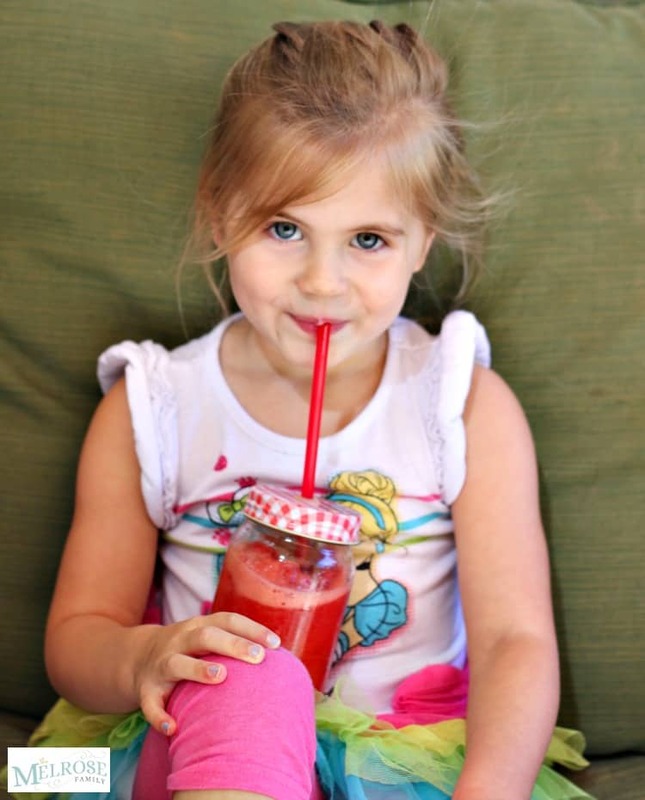 Plus, she made sure to get in on the action live when making this sugar free strawberry slushie. Pyure Organic Stevia makes it easy to sweeten without adding sugar or additional unnecessary calories. We used two drops of the Pyure Organic Liquid Stevia, but you could also use Pyure Organic Stevia Sweetener or Extract. Pyure makes it simple to sweeten all your favorite treats from cookies to cakes to frosting to slushies. 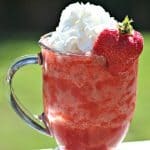 A simple three ingredient sugar free strawberry slushie. Add one cup of frozen strawberries, 3/4 cup of water and 2 drops of Pyure Organic Liquid Stevia to a blender. Puree well and serve in a glass. Top with a fresh strawberry and/or sugar free whipped topping.